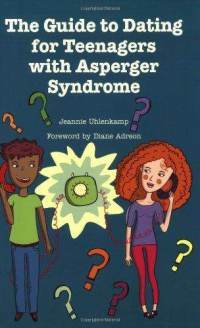 The Guide to Dating for Teenagers with Asperger Syndrome by Jeannie Uhlenkamp. For a teen with Asperger Syndrome, dating can be overwhelming.. Written in a question-and-answer format, this much-needed book offers insight and practical advice on dating challenges. Each topic is followed by Discussion Questions (to get the conversation flowing between teens and parents/teachers) and a Main Idea (which succinctly wraps up the main point). Also included are special notes to define the more illusive vocabulary and concepts of today’s dating world. Pp 129. This entry was posted in Adolescent/Transition Issues, Our Library and tagged adolescent, Autism Spectrum Disorder, books, romantic relationships. Bookmark the permalink.